We are officially almost finished our summer-long read through Dobzhansky’s evolutionary classic, Genetics and the Origin of Species. We have spent an awful lot of time talking about genetics – about mutations, and how their value is context-dependent; about chromosomes, and how breakdowns during cell replication and gamete production can lead to large-scale changes; about natural selection, and how it affects gene frequencies; but now it is time to actually roll up our sleeves and delve into the ‘origin of species’ part of Dobzhansky’s book title. Last week we explored polyploidy, a form of instant speciation that is solely due to reproductive incompatibilities brought about by chromosomal mismatch. In other words, last week we saw that a simple genetic cause (chromosomal duplication) led to instant speciation, simply because the polyploid and its parental form could not successfully reproduce (or, more precisely, their offspring could not reproduce); that is, the polyploidy event caused a reproductive barrier to form between the parent and its polyploid offspring. They were reproductively isolated. All sorts of creatures on this planet are reproductively isolated from one another. This has been the hallmark of defining a species in the non-scientific realm for millennia. In Genesis 1, God tells the plants and animals to reproduce ‘according to their own kind’, meaning that a cat would not spring from a poplar tree seed, or a duck hatch from a fish egg. Poplars would give rise to more poplars; cats to cats; ducks to ducks. And even more specifically, wood ducks would birth wood ducks, and mallards, mallards. The natural world was set apart by God as an ordered system in which like produces like, as opposed to the chaos of a world in which any creature could come from any other creature. This meant that species were self-contained. A cat could not mate with a dog and produce a cat-dog. A horse could not mate with a tulip to produce a blossoming foal. This reproductive isolation preserved the order. But there were well-known exceptions. A horse, bred with another horse, would produce more horses; a donkey, bred with another donkey, would produce more donkeys; but a horse bred with a donkey would produce something new: a mule. But mules themselves could not breed to produce more mules – they were effectively sterile. Something had happened to them that allowed their body cells to flourish (indeed, mules are work animals, being renowned for their incredible strength and tenacity), but their sperm or eggs cells to be non-functional. Indeed, the example of the mule is even more mysterious than it sounds. Mules are actually the product of a very specific mating – a male donkey with a female horse. The successful mating of a female donkey with a male horse is exceptionally rare, and produces a hinny. All male mules are sterile, but the occasional female mule can successfully breed with a male horse or donkey. In the last several hundred years, this has been recorded approximately sixty times. All male hinnys are also sterile, but the occasional female hinny can also successfully breed with a male horse or donkey. This has only been recorded once. What do we do with these observations? Dobzhansky quite cleverly builds off the experimental work with polyploids to suggest that, if reproductive isolation in polyploids is the result of genetic causes, then perhaps reproductive isolation across all lifeforms is also the result of genetic causes. And perhaps the reason some species can produce hybrids is because they are species-becoming – reproductive barriers are beginning to evolve between them, but they are not yet absolute. ‘Species formation without isolation is impossible,’ writes Dobzhansky. The reason for this is simple: if one species mates with another, the hybrids contain a mishmash of genes from both parental species. Any genes that have evolved together by natural selection for a particular environment will find themselves bombarded by genes that evolved together in another environment. Imagine an Arctic fox mating with a southern red fox. Perhaps its offspring will still be able to resist the cold, but it could lose its ability to blend in with the snow. Within the hybrid gametes, recombination will further destroy 'co-adapted gene complexes' by swapping physical bits of genes between chromosomes. The hybrid and its offspring, then, are misfits, adapted to nothing, and the uniqueness of the species is destroyed. Natural selection could then operate on those misfits to produce an adapted organism, but if they continue to mate with different species adapted to different environments, any evolutionary progress is continually lost. The only way to form a new species is to isolate it. Polyploidy does this quite effectively. The multiplying of the number of chromosomes within a cell prevents the plant from effectively swapping genes with a different species. It is free to adapt in unique ways to a novel environment without having to worry about constant genetic ‘invasion’ from outside. A simplified version of Dobzhansky's adaptive landscape. The x-axis could represent every conceivable cluster of genotypes; the y-axis represents the value of that cluster in a given environment. A, B, and C are three different species, each occupying an adaptive peak separated by a valley of low fitness. In this drawing, the direction of selection is shown as an arrow that causes the species in the valley (the ball) to climb the hill to one of the peaks. But the reverse is also true: A-B hybrids could fall into the valley between the species. Dobzhansky pictures species as ‘genotype clusters’, a unique assemblage of genetic material that is well-adapted for its particular environment. He envisions each species as sitting on its own unique hill in the adaptive landscape, with each hill representing a great fit between the species and its environment. Separating each species is a valley, representing a poor fit between the species and its environment. Organisms that tumble into that valley are picked off by the wolves of natural selection; so long as the environment remains stable, selection will ensure that species remain on their individual hills. But hybridization often causes both species to plummet into the valley dividing them, producing offspring fit for neither environment. Think of a weiner dog mating with a wolf – its offspring will not fare well in the home (too aggressive and unpredictable) or in the forest. If every weiner dog mated with every wolf, the result would be the eventual destruction of both forms. This is generally referred to as outbreeding depression (to distinguish it from inbreeding depression, the negative effects of mating closely related individuals). Importantly, Dobzhansky introduces a caveat – sometimes hybridization can actually launch the hybrids onto a new, never-before occupied adaptive hill, like we see in some polyploid plants that occupy new environments. But generally this must be relatively rare. There must thus exist a relationship between reproductive isolation and natural selection. If the formation of reproductive isolation is too slow, we would never have such a thing as ‘species’ – natural selection would cause populations to be adapted to their environment, but they would constantly interbreed and break down those adaptations. On the other hand, if reproductive isolation were too fast, we would have so many species that there would not be room for them all! The relationship that is struck is that natural selection tends to produce reproductive isolation as a side-effect of adaptation. A. Geographical isolation - This is a common form of isolation, in which two species do not interbreed because geographically they never encounter one another. Imagine, for instance, that you are a member of a species of fish that existed on either side of Central America three million years ago - just prior to the formation of the isthmus of Panama. You freely migrate back and forth across modern-day Panama, mating with members of your species in both the Atlantic and Pacific. And then something momentous happens – the passage closes up, effectively cutting off the two oceans. You are now stuck on one side with some members of your species; the other side contains other members that you will never see again. You mate on your side, they mate on their side, and never the two shall meet. Although in theory either population could mate with one another, in reality they never do. Mutations that appear in the Atlantic population are different from those that appear in the Pacific, and selection works on them in novel ways. They slowly diverge, until they can no longer be recognized as the same species. Imagine that one day they were to come in contact with one another. Will they remain distinct species, or will they form hybrids and become one homogeneous whole? The answer really depends on how different they have become. If mutations have accumulated that prevent breeding, then the populations will remain distinct. For instance, imagine that, originally, both groups had a genotype of aabb. The Pacific group then had a mutation, from a to A, such that they are now all AAbb. On the Atlantic side, perhaps b mutates to B, such that they are now all aaBB. And let us suppose that a combination of A and B is lethal. If the Pacific population were to breed with the Atlantic population, their hybrids would not survive; the two species would remain on their respective adaptive hills. Geographic isolation leads to reproductive isolation simply as a by-product of selection (and/or drift) in different environments. Experimental evidence for reproductive isolation via geographic isolation came in the 1980s, with Diane Dodd's experiment on fruit flies. Flies began as one freely-breeding species, were split into starch-fed and maltose-fed environments, were allowed to live and breed only within those environments, and then brought back together. The result: starch-fed flies preferred other starch-fed flies, and maltose-fed flies preferred other maltose-fed flies, even though they were the same species. Reproductive isolation in action? If the Pacific and Atlantic populations were to come together once again, selection could then work to enhance reproductive isolation directly (and no longer as a side-effect). Selection would favour those individuals that do not even try to mate with the other species. For example, if the Pacific fish tend to be larger than the Atlantic fish, selection could favour Pacific fish that prefer to breed with larger fish, and Atlantic fish that prefer to breed with smaller fish, as a proxy for species identification. Dobzhansky did not coin a term for this process, but today the act of selection working directly on reproductive isolation, after geographically isolated populations are brought back together, is known as reinforcement. The concept of geographic isolation indirectly leading to reproductive isolation is not merely hypothetical. Indeed, my imaginary scenario has a real-life basis. Studies of invertebrates on either side of Panama have led incredible support to this theory of speciation by reproductive isolation through geographic isolation. i. Ecological isolation – If two similar species occupy slightly different habitats in the same region, they simply may not meet each other to mate during the breeding season, thus keeping them reproductively isolated, even if in theory they could produce viable hybrids. ii. Seasonal or temporal isolation – If two similar species breed at different times of the day or year, or reach reproductive maturity at different times, they will never encounter one another when both partners are able or willing to mate. i. Sexual or psychological isolation – If two similar species are slightly different from one another, there may be a lack of mutual attraction between them (different scents, dances, behaviours, breeding colours, songs, etc) that prevents their breeding. ii. Mechanical isolation – Two species may be unable to mate because their sexual organs are incompatible. For example, some species of insects have very specialized genitalia that operate in a ‘lock and key’ manner. A male of a similar species will have a slightly different ‘lock’ that is not compatible with the female ‘key’. Or think of a chihuahua male trying to mate with a Saint Bernard – the size difference alone would make this highly unlikely. iii. Sperm cannot reach or penetrate the egg; pollen tube growth arrested. For example, the female reproductive organs of one species may have an internal pH that is lethal to the sperm of another species. iv. Inviability of hybrids – Fertilization takes place, but the hybrid dies at some stage of development before it becomes sexually mature. Amazingly, some completely unrelated organisms, such as worms and sea urchins, can produce hybrid zygotes. 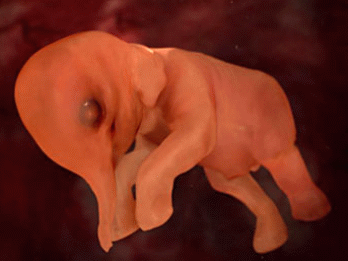 But developmental problems terminate the zygote before it reaches maturity. 2. Hybrid sterility – Two different species mate; the egg is successfully fertilized; the hybrid is produced; but the hybrid cannot produce functional gametes. The reason for this tends to be chromosomal. Horses have 64 chromosomes; donkeys have 62. Mules have 63. This means that not every mule chromosome has a homologous partner during meiosis, and gamete production fails. The hybrid is then quite sterile. Another option, not listed here but alluded to under reinforcement, is that hybrids could be fully fertile but be selected against due to their intermediate, unadapted phenotypes. That too could be a cause of reproductive isolation. If evolution were true, and populations diverged to form separate species, we would expect to see a gradient in nature, between ‘true’ species, which cannot breed with anything else, to species that can successfully fertilize other species without producing offspring, to species that can successfully produce sterile offspring, to the production of non-sterile offspring that perform poorly, to the production of non-sterile offspring that perform quite well, to different populations within the same species, to varieties within a population. And indeed this is exactly what we see in nature. One remarkable prediction of speciation by reproductive isolation is that, if two closely related species can mate with each other, we would expect reproductive isolation to be stronger between them in ranges in which they overlap, than between populations that are geographically separated from one another. Dobzhansky describes work on his own favourite organism, the fruit fly, that validates this very bizarre prediction. Drosophila pseudoobscura co-exists with Drosophila miranda for only part of its range. In those regions of overlap, flies from the two species are not very willing to mate with the other species. But when D. miranda and D. pseudoobscura are acquired from regions in which the one species never encounters the other, they are much more willing to mate in the laboratory. Clearly selection is enhancing reproductive isolation between the two species only where it is needed. Without isolation there would be no species. Dobzhansky, in this chapter, presents a theory of speciation that is stunning in its simplicity, which has experimental validation, and which has an underlying genetic basis. But he is not quite done; in the penultimate chapter, he delves a bit more into the genetic basis of speciation, by discussing hybrid sterility.